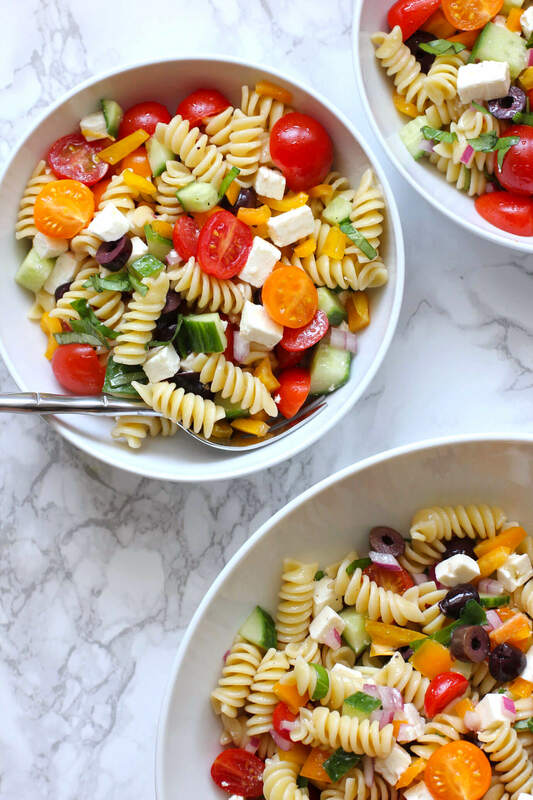 This greek pasta salad is an easy, crowd pleasing pasta salad packed with colorful, healthy veggies. It’s perfect for parties, backyard barbecues or family get togethers. 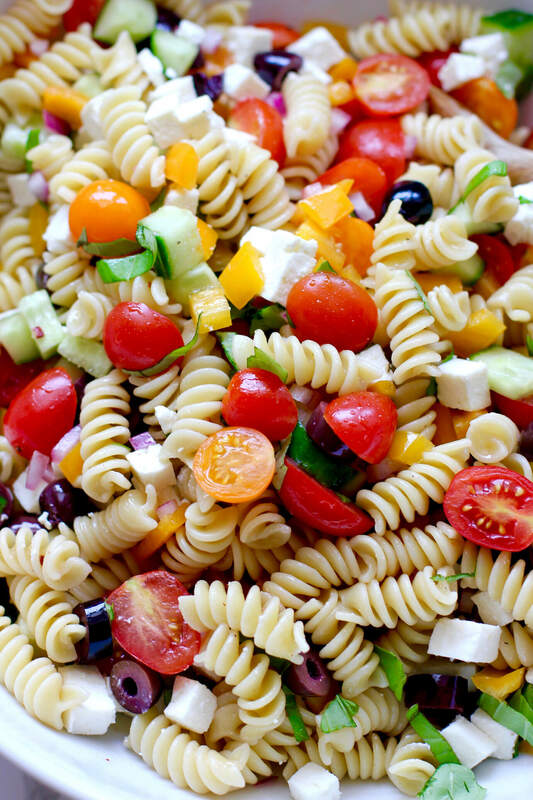 With Labor Day just around the corner, I thought I’d share this easy Greek Pasta Salad. It’s packed with pasta, healthy veggies, salty feta and tossed with an easy, flavorful vinaigrette. It’s a crowd pleaser – so make a big batch! 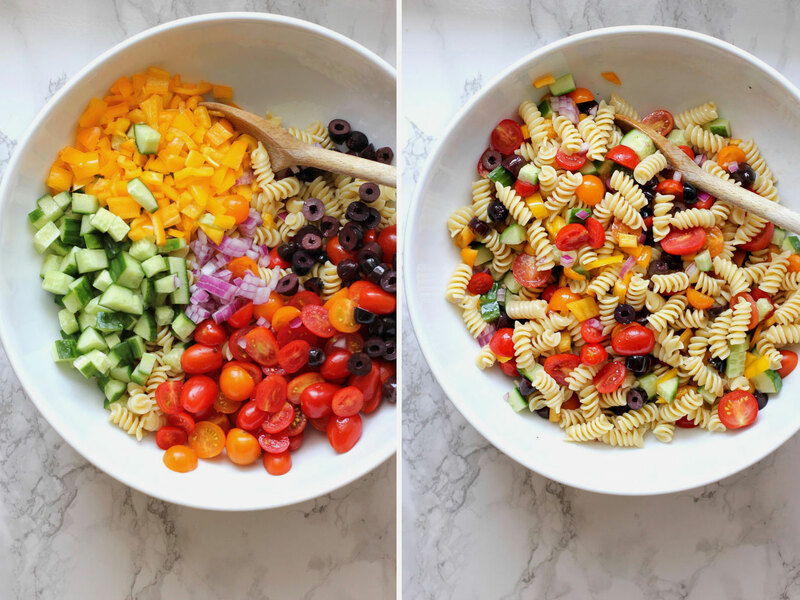 Pasta salads are so easy to make and I love adding lots of healthy veggies to them. 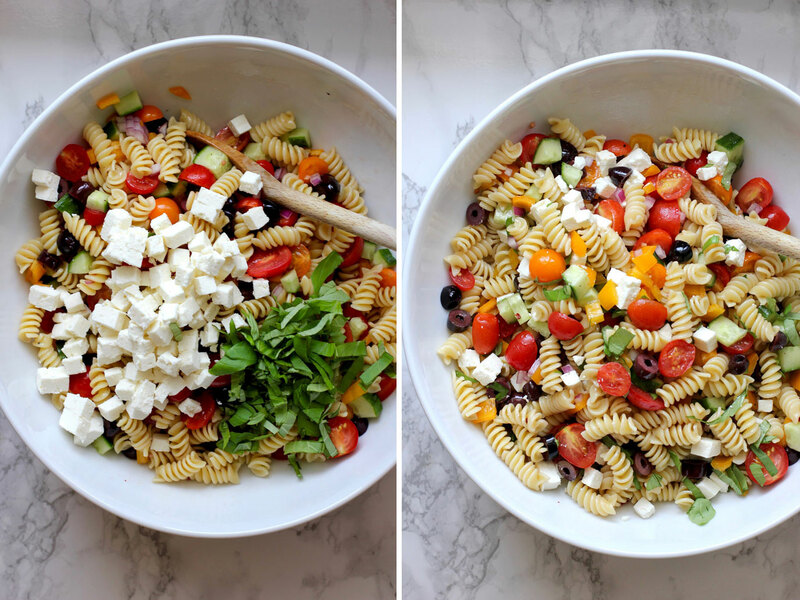 The base for this pasta salad uses traditional greek salad ingredients – salty feta (my favorite! ), cool cucumbers, sweet cherry tomatoes, olives and crunchy bell peppers. All the ingredients are tossed with cool cooked pasta to make a delicious pasta salad to share with family and friends. This salad works well for parties, family get togethers or backyard barbecues. It’s a great side salad that’s quick to make – ready in less than 30 minutes. Chop up all the ingredients while the pasta is cooking and prepare the dressing. When the pasta is done, rinse under cold water. You want the pasta to be cool when you add the veggies to it. Add the cooked, cool pasta to a large bowl. 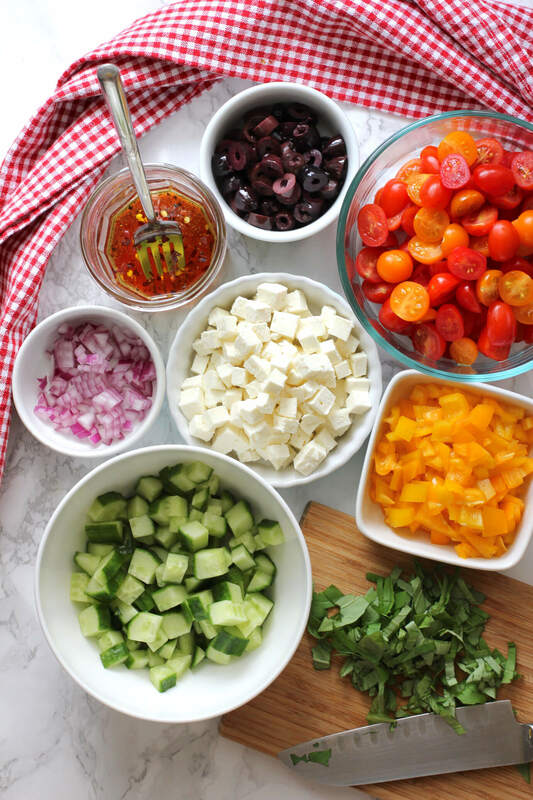 Add your veggies – the chopped bell pepper, cucumbers, cherry tomatoes, olives, and red onion. Pour the dressing over the pasta and veggies and toss to combine. I like to add the feta cheese and basil separately and gently toss. This keeps the feta from breaking up too much. After draining the pasta, run it under cold water while stirring it with a wooden spoon. You want the pasta to be completely cool before adding the veggies. Make sure to throughly drain the pasta after rinsing it with cool water – you don’t want your pasta salad to be soggy. I used a yellow bell pepper since I like the color contrast but you can use a green (or red one) if that’s easier to find. I used an english cucumber – it has fewer seeds than a regular cucumber. If you are using a regular cucumber, be sure to remove the seeds by scraping them out with a spoon. I like buying blocks of feta cheese and dicing it for my salads. I think the crumbly kind sort of disappears into the salad. Diced feta tends to hold up better. Just toss gently when you add it. This is an easy make ahead recipe and it holds up well in the fridge until you are ready to eat. If there are any leftovers, I like to pack them up in individual containers so I have an easy lunch ready for the next day. Traditionally, oregano is used in greek salads, but I used basil in this recipe since that was what I had on hand. Greek anything, all of the time!!! So fresh and satisfying!!! 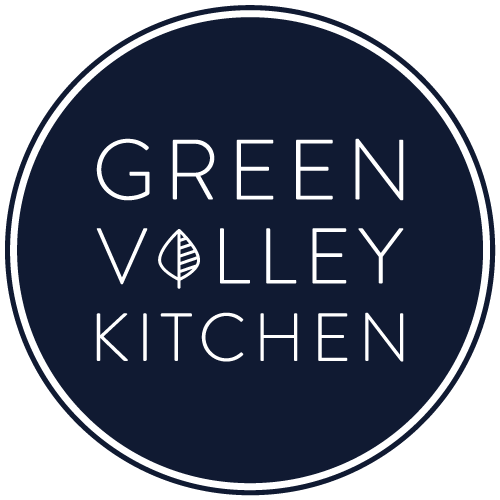 So easy, fresh and delicious Geraldine. I love pasta salads for parties all year round too. This would be great for football season too! Happy weekend! Thanks so much, Mary Ann – definitely good for football season! I love how festive your posts always are! The colors and flavors just pop! This is perfect for this weekend – all I need to grab is some fresh basil! Have a wonderful weekend, my friend! Thanks so much, Annie! Thanks for the comment about the color and flavor – that’s my goal with the recipes! Hope you have a great weekend, too! Nice salad. I love all of the ingredients – the colors and textures, and I especially love the vinaigrette! Summer! So easy, yes and what eye popping color! I love summer salads like this; shareable, can hang out in the fridge, easy to make and packed with flavor! Hope you have a fabulous long weekend, Geraldine!